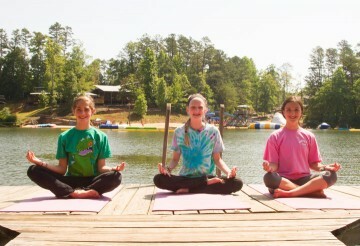 Our goal is to provide the safest and healthiest environment for your child! Our state-of-the-art Billi and Bernie Marcus Health Center is staffed by a resident physician and 4 to 5 Registered Nurses, all of whom live at Camp and are on-call 24 hours a day. Our staff are fully equipped to handle a range of medical and dietary issues, and we will work closely with each family to assure that your child feels comfortable and safe with us. A number of additional medical care facilities are readily available and can be reached within 4 miles of Camp in Cleveland, 25 miles away in Gainesville, and 60 miles away in Atlanta. Any camper who takes medication while at Camp must have it filled and packaged through LTC/Camp Scripts. Orders are due to LTC Scripts by May 3rd for first and A session campers, May 17th for B session campers, May 31st for second and C session campers and June 14th for D session campers. When registering, use CBM as the Camp ID. Please use the links below to access additional information about medications at Camp Barney. If your question still needs to be addressed, please contact marcushealthcenter@campbarney.org. Please remember, we cannot accept medications at the bus unless you have prior approval (including refrigerated and emergency meds (inhalers, EpiPens, etc). To request prior approval, please email marcushealthcenter@campbarney.org. If medications are brought on opening day without prior approval, we will hold out 3 doses and require that the script be rush ordered and filled out by LTC/Camp Scripts and shipped directly to Camp. Any expedited fees will apply. Packaging through LTC/Camp Scripts will ensure safe and efficient medication administration for your child. 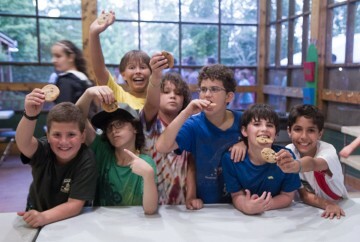 Our 18,000 sq ft. historic timber Alterman Lodge (dining hall) is a centerpiece of life at Camp Barney. It truly embodies our sense of community, and the food’s pretty great, too! Three meals each day are served family-style from our Kosher kitchen, and a host of options are available for each child – whether they have serious food allergies or dietary concerns or are just a plain picky eater! Our food service director actively creates menus with our chefs to handle virtually every food allergy and dietary restriction. Each meal served will have vegetarian, gluten-free, dairy-free, egg-free, and tree and peanut-free options, among several others. We also offer a fully-stocked salad bar at every meal to give kids more healthy choices.